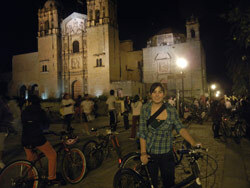 I volunteered in October/November 2011 in Oaxaca, Mexico with ProWorld. I was an intern for two different projects. First, I did marketing, translation and community outreach for Mundo Ceiba, an organization dedicated to raising environmental awareness, mainly through reforestation and bicycling. And for a few days a week I also worked as a communications liaison for a young women’s support group. We discussed issues like education, domestic violence and sexual health. Every other week, we got to take a day trip to a nearby village to speak with women there about their roles as women in the family. My favorite trips were those we took to the weaving village of Teotitlán and the huge market in Tlacolula. I have always been an active volunteer in my community at home, so combining that with an interest in travel and learning Spanish made volunteering abroad perfect for me! 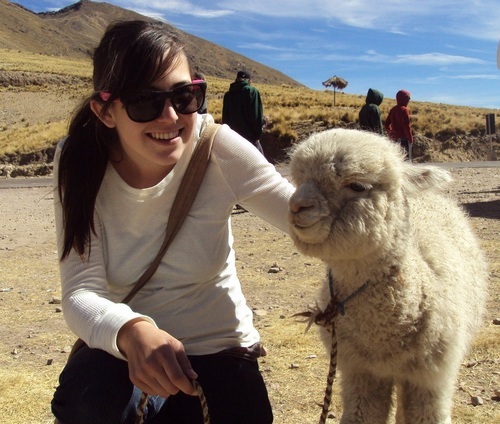 When I studied abroad in Peru in college, we also did volunteer activities. This service-learning trip was the perfect combination of studying and volunteering abroad and inspired me to learn more about this type of travel. I think the biggest surprise was the culture shock. It’s not that I didn’t expect it, but you can just never really predict what the differences will be and how they will affect you. I was also surprised by how quickly I remembered my Spanish and felt comfortable knowing my way around the town. I was also pleasantly surprised to have such a wonderful host family and meet so many other amazing volunteers. What cultural differences did you notice? 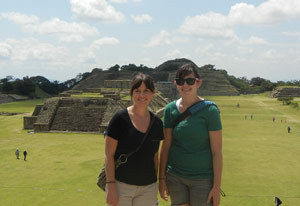 There are many cultural differences, big and small, that I noticed while living in Mexico. One of the biggest differences was the emphasis on family life. Families are larger and spend more time together, which isn't too surprising, but children also live with their parents until they marry and generally don't move too far afterward. My host family was so welcoming and interested in me - they had been hosting travelers from around the world for 10 years! Another major difference was the access to technology. Don't get me wrong - my family had WiFi and cable in the house, but mainly as a courtesy for their travelers. It was nice to see the family spend so much time together without worrying about cell phones or social media. I have an especially fond memory of watching a video of my host mom's family reunion with her. She pointed out family members as we watched the happy 300+ person family sing, dance and eat together. I took Spanish classes twice a week and went to a few conversation clubs at my host brother’s school. Both of these experiences were very different than school and clubs I’ve participated in back home in California. I also attended my host brother’s English conversation club a few times. It was a great chance to interact with local youth and learn about them and their perceptions of America. They were much more open-minded and positive than I had expected. 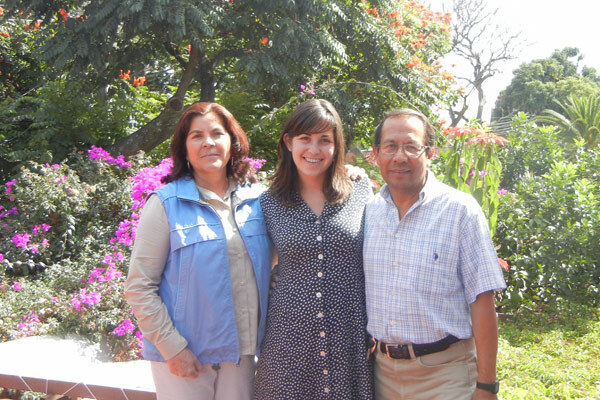 I continue to reflect upon and write about my time volunteering in Mexico on a daily basis. It definitely helped that I blogged and journaled on a regular basis while I was there. Now, not only have I been working in the volunteer abroad industry since then, but I have also had the opportunity to write articles, blog posts and short stories about my volunteer abroad experience. I’m confident that this hugely successful trip will continue to influence me for years to come. Working at Mundo Ceiba was a challenge every day because it was just the boss Ruben and me in a tiny office. Ruben didn’t speak any English and my timid Spanish was a struggle for him to understand. I learned a lot about small-town Mexican culture from Ruben as he was very traditional in many ways. Any time you get to spend working side-by-side with someone who has such a different background and experiences, you get a totally new and completely unique look at another culture. Returning was harder than I imagined it would be. I was very excited to return home to friends and family but there was part of me that was very sad to be leaving my new home. I tried my hardest to soak in all the best parts of Mexico before leaving. I realized my two months there wasn’t nearly enough. It made me think about the difference between long-term and short-term volunteer programs and why long-term volunteering is so much more impactful and effective. And of course I would love to travel abroad again as soon as possible! Do as much research and planning as possible. Of course it’s possible to have a successful volunteer trip without much preparation, and if that’s your style, go for it. However, in my experience, I have noticed that the more effort you put into preparing yourself – physically, mentally, emotionally and educationally – the better your experience will be. I suggest that you read reviews from past volunteers, email organizations to learn about what you will need, find out where the program’s money goes, etc. Friends and family – I wanted to share everything I was experiencing with them and not being able to do that was hard for me. Even once I was back home, it was hard to explain to them what it was like. This is one of the reasons I continue to educate others about volunteering abroad and to write about my own personal experiences more than a year later. I had an amazing time and grew so much. You can never tell what volunteering abroad will be like or how it will affect you, so I urge you not go into it with expectations. If I had focused on all the negative media centered on Mexico, I might never have experienced volunteering abroad in Oaxaca. 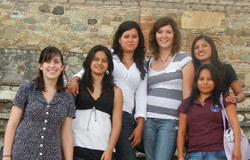 On my last week in Oaxaca, I was able to individually interview each girl in the young women’s group. Learning about their reasons for becoming part of the group was truly inspiring. One girl was especially interested in education for women because she was the first in her family to go to college. Another girl opened up about the abuse in her family. I can never thank these girls enough for sharing their lives, hopes and dreams with me. These smart, sweet, strong young women taught me so much about myself as well as what life is like for women in Mexico. They truly made my volunteer abroad trip more meaningful than I could have imagined. My future plans involve spreading the word about the benefits of volunteering abroad. It’s such a great experience that I hope more people have the chance to take part in. I currently work as the Volunteer Abroad Marketing Director for Go Overseas. I feel so lucky to be able to share my experience, teach others about the world of volunteering abroad, and learn about other volunteers’ experiences abroad. Katie’s job allows her to stay up-to-date on all the latest volunteer abroad programs, and she has the satisfaction of working in an industry that provides people with enriching, life-changing experiences abroad. We commend Katie for her dedication to bringing positive change to those in need! Katie’s current career path is fairly well-defined and allows her access to myriad international opportunities. If Katie wished to expand her role or further develop her “global career capabilities,” she might focus on building language fluency. In the long-term she might also consider parlaying her experience with international experience into NGO work, since she clearly has a passion for helping those in need directly. Those interested in volunteering abroad in a developing nation, should read Types of Volunteer-sending Organizations, which provides a broad overview of the many options available.